The first political congratulations are seeping in ahead of the conductor’s birthday tomorrow. 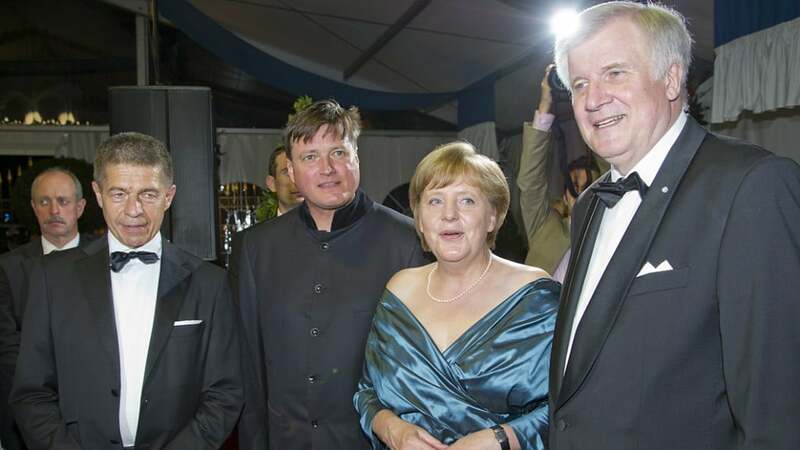 Doubtless a telegram tonight from Angela Merkel, a firm admirer. Sixty is a career midpoint for a conductor. Thielemann, music director in Bayreuth and Dresden, is triumphant in the German-speaking world and a popular figure in China and Japan. The three essential composers are, in his view, Beethoven, Wagner and Richard Strauss. He hardly ever appears in the English-speaking world. After early ventures with the Philharmonia Orchestra and Covent Garden, he seems to have abandoned British and American laurels to less assertive conductors. To date, nothing CT has done has etched an imprint in yours truly. He is modern and efficient and a good conductor for sure but he overthinks and micromanages it out of oxygen a bit? I prefer music making with more abandon and sweep, a language CT does not speak. Still, happy birthday. Caravaggio, I agree with you about CT’s micromanagement. His Bruckner is better than many out there these days, but to mention it in the same breath as Karajan, Jochum, and other top Bruckner conductors would not be fair. He micromanages the music to death, and I’ve found myself screaming at my loudspeakers, “Stop it! Just play the music! !” I’ve purchased most of his Bruckner on CD, but none of it sticks. I have not heard Thielemann live. I once came upon a performance of a symphony on the wireless. I di not recognise it, but it turned out to be one I knew very well – it was conducted by C Thielemann. Who knows he may yet venture out of Germany to take over the RCO job in Amsterdam. Not necessarily a better orchestra than Dresden Staatskapelle. CT at the RCO?? I find that notion thoroughly depressing. Not nice of you, given that it’s my birthday tomorrow as well. There is something about Thielemann that leaves me feeling a disconnection between inner self and celebrated, shown emotions. Hard to describe. Like as if he were holding back something of his personality in a closet. His body language, the way he speaks and breaths. Like a pressure cooker under high pressure. Certainly a high intensity. But causing me personally more discomfort than heartfelt musical compassion. Maybe that’s just me. Tamino, you’re not exactly being subtle. We all get what you are saying. In a day and age when leading gay conductors like Yannick Nezet-Seguin and Philippe Jordan are out, let alone lesser ones like MTT and Marin Alsop (and there are more for sure), it’s hard to understand CT’s closet. actually that’s not what I meant. He’s a very private person. Herr Doktor, CT isn’t in any closet whatsoever. Everyone knows his partner who accompanies him both socially and professionally. CT is simply a private person who doesn’t make a meal, song and dance of his private life, like that egomaniacal Instagay in Philadelaphia and the Met whom you mentioned yourself. Would you rather he did that? Showing off his tattoos and swimming trunks, and holding hands with his beloved for the Twitterati? Straight conductors don’t do that either, so why would you hold CT to a different standard and claim that he’s in a “closet” just because he doesn’t do a media circus of his life? Everyone knows his partner? Well, I don’t. I was never interested in his private life. Perhaps I’ve already seen the partner around CT, but I definitely don’t look at the people surrounding him, speculating about who selects his shirts. I don’t like closeted gays who pretend being homosexuals in showing off a partner (of the other gender) and even a family. I think that’s highly unfair towards the children who’re forced to play their roles in the show. However, I don’t have a problem with someone who decides to keep his private life really private. As long as Mr T’s or Mr X’s partners are consenting adults it’s certainly no business of mine to talk or even to judge about. Hence I think Mr Thielemann’s private life shouldn’t be a subject here and speculations about if and what he perhaps suppresses – in my (more or less humble) opinion that’s not exactly in good taste. Are you criticizing the way he moves, or the music he draws from the orchestra? I think you should limit yourself to terms that you can print, not have to substitute ***for. I personally find this language offensive. This is after all , a classical music discussion forum. Thank you so very much for your moralizing…. Your extremely rude post doesn’t really deserve an answer. Nevertheless does artistic expression (and its reception) not work in the way that one can put ‘exactly the finger on what one likes’. You should know that. All I’m saying is what I see and feel, my personal impression of an artist. And sorry if the word ‘closet’ was badly chosen, because it implies a certain issue. It wasn’t meant that way, but very general, about a feeling that someone doesn’t show his true self. Artists on stage have to live with the fact, that people have certain impressions about them. Tough job, if you can’t stand the heat, leave the kitchen. The last of the sauropods. He makes the best possible case for more women conductors. No wonder the BPO went for Petrenko. I think CT is light years ahead in kudos and prestige having taken the gigs he has!! Petrenko is a turn-off and I’ve cancelled my BPO Digital Concert Hall subscription. Too much PC in that orchestra for my liking. Their programming just isn’t interesting enough either. Yes Petrenko lacks the prince Valiant hair and is much too PC to share any purity of culture treatises with us. Always good to hear the thoughts of the Riefenstahl wing of contributors. I would never, ever defend some of Sue’s political views. But equating her to Riefenstahl is as appropriate as it is to call Trump bashers communists. The latter has happened even in this blog. If Trump critics, or bashers, suggested that the preferred alternative was a Maoist or Lenin/Stalinist form of government, which they obviously don’t, then the accusation of being a communist would merit consideration. Do you really think that of all the prominent conductors in the world or even Germany/Austria choosing to take a swipe at Petrenko, in a string discussing the merits of CT, was a coincidence? Is there any doubt that Petrenko was chosen to serve as a cultural/political trope of the most base variety? Thielemann made a number of visits to the Minnesota Orchestra in the mid 90’s and I have longed for a return visit since. My guess is that Thielemann will replace Muti at the CSO. Like Muti, he’ll say all the right things about how he’s not interested in a US music directorship, but they’ll twist his arm to guest conduct (for the first time in 25 years or so), he’ll say how blown away he is by their quality and commitment, etc.. And he’ll sign on. IIRC this was also sort of the way it worked with Haitink. He had no history with the CSO, they lobbied him hard to come guest conduct, and eventually lured him into a late-career principal conductor stint. I don’t doubt you’re right. I base my speculation strictly on basis of it seeming like the kind of unlikely scenario that could happen. The CSO has in the past been big on insisting they must have the best of the best (and biggest of names), and the Grand Old Man type (Barenboim was only 47 but was on track). In the next couple years that’s probably Salonen, Sir Simon and Thieleman. And Salonen is off the market. But as I said above,I KNOW him (worked for years under his baton). For several reasons he will not take an orchestra that far away from his home. I really don’t know any other conductor who hates travelling and beeing NOT ant home that much as he does…consider him Berlin-or Viena-based in his future. And this has nothing to do with the quality of chicago! I doubt it. I think the CSO will choose either another Italian (probably Riccardo Chailly) or a woman, likely Marin Alsop. The latter would be a superb move. And we should be grateful that Haitink gave into the supplications. His time with the CSO was fruitful indeed producing masterful recordings of Mahler, Bruckner and Shostakovich. The most talented conductor alive. He thoroughly deserves his reputation for his interpretations of the romantic repetoire (although he is not just limited to that as many assume…). His recent Mahler disc with the Munich Phil is a revelation, and clearly speaks against those who criticised him for not conducting many concerts of Mahler in his career thus far. His own defence – that he was not ready – is perfectly adequate (and I wish more conductors would reduce the size of their repertoire if it led to interpretations as good as those of Christian Thielemann). His Tristan is life-changing. I do so hate superlatives in matters of music! “The most talented conductor alive” – for saying so you would have to know every single conductor alive. I can’t image you do, hence you can’t say that Thielemann is the most talented alive. Perhaps there’s one in Timbuktu who’s even more talented? Besides: Who judges about a conductor’s talent? Which points are counting for such a judgement? I couldn’t agree more. Karajan came to Mahler late, and his recording of the 9th symphony is very highly regarded. This is a very interesting speech. Like him or not, he knows his craft and has a lot of wisdom to share. I wish there were more young people in the audience. I don’t think much of his choice of the 3 top composers. In my opinion, they are: Mozart, Bach and then Beethoven. I would put Tchaikovsky and Debussy ahead of Wagner, but the conductor is a German. Much as I love Tchaikovsky, I think not. Awful to work with – once was enough here in London. Anon: Obviously, CT has the very same opinion about you. First heard CT conduct Palestrina in 1997 at RoH which sparked my interest – a young conductor with vision and focus. Twenty years on and having heard about 200 performances across Berlin, Munich and Dresden – thank you and happy birthday Kapellmeister. From a glorious Rosenkav. at RoH to Ariadne in Dresden via Die Tote Stadt in Berlin (and naturally Wagner) – one of the great conductors in this repertoire. And more experimental on the podium conducting symphonic works – including Bruckner- than his recordings relay. For me, he doesn’t need to conduct a wider rep. or discuss his private life. Both are his choice, his business. Just needs to carry on in Dresden making great music. I have read over the years that he is a Nazi supporter. That is enough for me to not listen to his performances. I’m no special fan of his but I think it’s unfair to name him a “nazi”. In my opinion he sometimes lacked the last sensitivity when it came to this subject, but I wouldn’t name him a full fledged nazi just because he loves Pfitzner and is fascinated by Prussian things. Er…I think he suggested that the people who were marching for the AfD needed to be listened to and understood (even if you don’t agree with them). But he was rather clumsy in the way he said it so some people assumed he held far-right opinions. Otherwise, he has barely expressed any political opinions and shown little interest in politics. I have always found CT ponderous, earthbound and somewhat unimaginative. Richard Strauss an essential composer ??? Bach, Mozart, Haydn, Debussy, Mahler, Schönberg, to mention a few, have played a far more important part in the development of classical music . The worst Beethoven’s 8th and 9th I heard years ago with Wiener Philarmoniker. Not only he had no idea and conducting was anemic, but he made the orchestra play bad!!!! just let the orchestra play when you have no inspiration and such an orchestra, performance will be at least honest. “Don’t disturb it when it’s working” as used to say HVK. That’s pretty much what C.T did for New year’s concert, no distinctive print, just letting fine orchestra play, so at least it was not bad, just unremarkable. At this time where Abbado, Jansons, Mehta, Blomstedt, Haitink are gone or almost gone, I am not about to regret that C. T has retired some day…..Maybe he’s better for opera, I let him benefit of the doubt about that, never heard him….